Districts: An Phu, Tan Chau, Phu Tan, Chau Phu, Tinh Bien, Tri Ton, Cho Moi, Chau Thanh, Thoai Son. Geography: An Giang Province is located to the west of the Mekong Delta between the Tien and Hau rivers and shares a 100km border with Cambodia in the north - west. It also shares border with Dong Thap Province in the east, Cantho City in the south - east, and Kien Giang Province in the south - west. Transportation: An Giang has a relatively convenient land and water transport system. National Road 91 connects to Cam-pu-chia. Buses run from Chau Doc to Long Xuyen, Cantho, and other destinations in the Mekong Delta. Long Xuyen City is 62km from Cantho, 125km from My Tho, and 190km from Ho Chi Minh City. Chau Doc Town is 96km from Ha Tien, 117km from Cantho, 179km from My Tho, and 245km from Ho Chi Minh City. 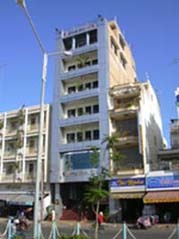 Trung Nguyen Hotel is located in Center of ChauDoc Town. - Chua Xu Temple was built in 1820 on Sam Mountain in An Giang province. According to a legend, in the early 1800s villagers found a statue of a lady dating to the 6th century in the forest. They built a temple in her hornor, hoping that she would bring them better crops and better lives. This is why the marble statue of Ba Chua Xu, meaning "country lady," is worshipped. - Ben SongSao Hotel is located in Center of ChauDoc Town. - From Long Xuyen, one has to travel almost 60 km to get to Sam Mountain which lies west of Chau Doc, at approximately 2 km from the frontier between Vietnam and Cambodia.